Summer, known for some of the hottest days of the year, irritatingly humid days and afternoon storms rolling in from the west. To the sane individual this would equate to lounging around inside, by the pool, in the ocean or anything to get away from the relenting heat. This is however the complete opposite for all keen anglers, this is the start of jack season! Time to start waking to the sound of an alarm at 3am, getting ready and making your way down to the water in a half drunken like state of slumber all to ensure your at “the” spot first thing and ready to start casting. This is a common practice for many anglers around the coast during the summer months, both experienced anglers and beginners alike. All have one goal in mind, to land a mangrove jack now whether that be their first mangrove jack or their hundredth. The feeling of landing one of these fish is the same no matter how many you may have caught or the size. But what happens as it starts to cool off on the coast, most anglers begin targeting other species such as the tuna which visit the coast in plague proportions in the early months of Autumn and the following trevally species which flood our rivers or the snapper that appear just off our beaches in the shallow reef system and coffee rock formations. But where does that leave all of us keen jack fishos? Easy, continue fishing for them! They are still there, although they might not be as fired up compared to a scorching hot summers afternoon! Just got to work a bit more for them, with some great sessions to be had during these cooler months! Like always when targeting mangrove jacks look for areas of structure, this could be fallen timber, mangroves, rock bars, pontoons, bridges and boat moorings. Typically I have found that areas like rock bars, rock walls and retaining walls hold more fish due to the rocks and concrete holding the heat of the sun better and as mangroves jack are more active in warmer water it holds more active fish than say timber or pontoons. Lure choice is an important factor during these cooler months even more so than during Summer as the fish are more lethargic and finicky. Matching the hatch is key, using smaller lures for those more shutdown fish and dropping leaders down from the standard 20lb and 30lb to 14lb and as low as 4lb in systems where the water is clearer. 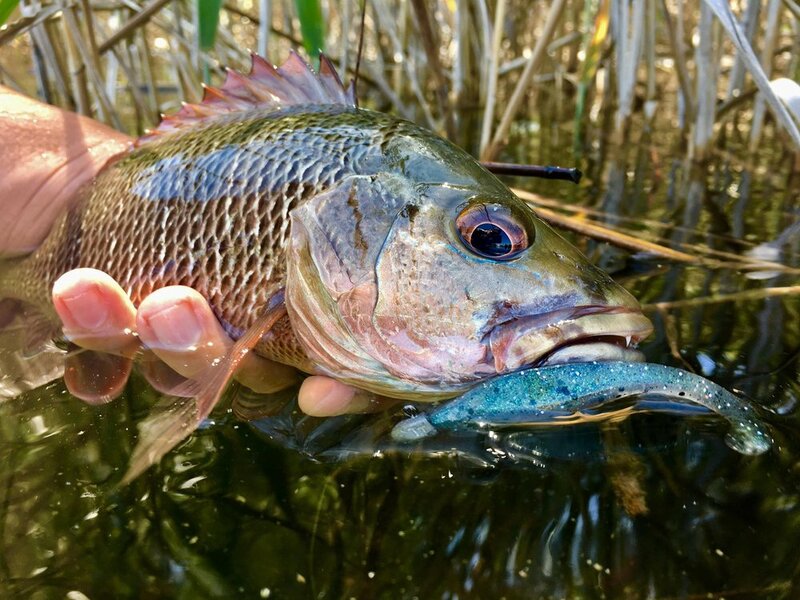 Due to fishing these lighter leaders I usually see myself opt for a small soft plastic rather than hardbodies, because they are a cheaper alternative and when fishing light leaders for mangrove jacks you are bound to loose a few lures. Fishing soft plastics also allows you to slowly work through an area more thoroughly. Using finesse setups are key as when using these smaller profile lures it enables you to cast further and more accurately with less hassle. Depending where and what I'm fishing with will change the gear that I use at the time. When fishing rock walls, pontoons or any area where a longer cast is requires I typically use light spin rods seven foot in length and either 2-6lb or 4-8lb and line to suit all of which depends on how and where you like to fish. Using bait caster setups allows the angler to make accurate casts into tight structure where mangroves jacks tend to hangout. Coming from experience I have found it best to set drags lighter rather than heavier when fishing these light leaders…I found this out the hard way. Heavy drags, light lines and oyster encrusted rocks don't make for he best combination! Fishing lighter drags allows the fish to run, however running these drag settings you will often have fish take you back into their homes but with a bit of patience and luck most of the time you can get them! Sometimes though it doesn't matter what you do, they just get away whether you're fishing 6lb or 30lb and thats the reason jack fishing has become so popular for lure and bait fisherman alike. Mangrove jacks are one of my favourite fish to target, the hours you put into targeting them, the initial strike and the power of these fish is unrivalled in SEQ estuaries this keeps many anglers constantly targeting jacks throughout the year with winter being no exception! So this coming winter don't rule out jacks because you might be surprised at how active they can be! Tight lines!